“The storm has entered the Gulf.” For those who live or travel near the Gulf of Mexico, this ominous announcement commands attention, especially given the frequency and force of hurricane strikes in recent years. Since 2004, the shores around the Gulf of Mexico have been in the crosshairs for an increasing number of hurricanes and tropical storms, including Charley and Wilma in southwestern Florida and Ivan, Dennis, Katrina, Rita, Gustav, and Ike along the northern Gulf coast from Panama City to near Galveston. 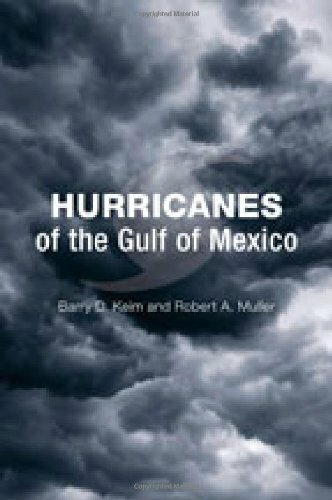 In this definitive guide, climatologists Barry D. Keim and Robert A. Muller examine the big picture of Gulf hurricanes—from the 1800s to the present and from Key West, Florida, to Mexico’s Yucatan Peninsula—providing an extraordinary compilation and interpretation of the entire region’s hurricane and tropical storm history. Drawing from their own research and from National Hurricane Center records, Keim and Muller examine numerous individual Gulf storms, considering each hurricane’s origin, oceanic and atmospheric influences, seasonality, track, intensity, size, point of landfall, storm surge, and impact on life, property, and the environment. They describe the unique features of the Gulf that influence the development of hurricanes, such as the loop current and its eddies, and identify areas of the coastline that are more or less vulnerable because of physical environment, socioeconomic environment, or both. They point out that the increase in population along the Gulf Coast over the past century has led to a rise in hurricane damage as once sparse coastlines are now lined with residents, commerce, and industry. In addition, they assess predicted hurricane activity for coming years in light of competing climate theories as well as cyclical patterns over the past century. Keim and Muller begin their book by scrutinizing the Gulf’s deadliest storm, the Galveston Hurricane of 1900, whose victims received little to no warning of its approach. They then retrace 2005’s Hurricane Katrina, the most costly storm, using NHC advisories and reports. Their comparison of these two catastrophic events shows that despite 105 years of tremendous technological advances, hurricanes remain ultimately rather unpredictable and human warning, readiness, and response measures continue to be imperfect. Keim and Muller also detail other memorable Gulf storms—the Labor Day Hurricane of 1935, Audrey, Betsy, Camille, Gilbert, Andrew, Wilma, and more—and give the hurricane strike records from 1901 to 2005 at thirty locations around the Gulf. They extend the New Orleans hurricane strike record back to the middle of the nineteenth century, providing key insight into comparisons of storm activities during the two centuries. An epilogue summarizes the destructive 2008 hurricane season, including storms Dolly, Gustav, and Ike. Plentiful maps, charts, tables, graphs, and photos, along with anecdotal observations and an informative text, make Hurricanes of the Gulf of Mexico a captivating and useful volume for Gulf residents, storm trackers, or anyone fascinated by the weather.